Halloween at Amanda and Derek's, a photo by PhylB on Flickr. 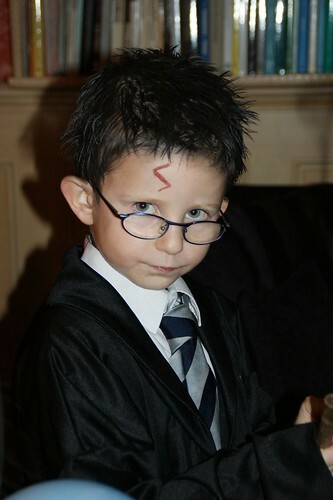 Léon is a bit obsessed by Harry Potter at the moment and insisted on dressing up as him for Halloween. I didn't think it would be too difficult given he has a Hogwarts cape and could just use his own school uniform underneath (albeit the tie is the wrong colour for Gryffindor). The one problem was Léon's blond hair. I have coloured the kids' hair before using the water-based face paint and it worked so well, dried immediately, washed out simply with water and was completely unproblematic. Yesterday, as I went to dye his hair though I realized Charlotte had finished the black face paint making Léon into a pirate last month... crisis! No worries - I noticed there was a box containing just black and white face paint beside the rest. Someone must have had the foresight to replace it - phew. I was in a rush - I had four witches and a Harry Potter to face-paint in less than half an hour! I got Lots to paint Léon's head while I made myself green. I was struck by the greasy look of his hair while she was applying it. Face paint usually looks powdery and dry on the head. I figured it wasn't dry yet and we set out for the party at Derek and Amanda's house. At the party one of Amanda's friends was rolling and tumbling with the boys in the bedroom while I was in the living room. Suddenly I noticed her running for a basin of soapy water... some of Léon's paint had come off on the bedroom carpet while she was tickling him. I immediately decided to wash it out of his hair quickly so no further accidents would take place, though I was still puzzled it had rubbed off on the carpet as it doesn't usually... Then the fun began. I stood Léon (protesting because he wasn't done being Harry) under Derek and Amanda's shower. Why wasn't the water paint running down his body like it was supposed to? Had Charlotte used so much I would actually need to apply soap? I lifted down the shampoo and put it on. His head felt greasy but the shampoo made no impact! I gave him a second shower using shower gel on his head - none of the black came off, then shampoo again, nada! Arg! After a forty minute shower my blond boy was still greasy and black. What the hell had Lots used on his head? The box definitely said face paint. I gave up. Later that evening Lots was removing her face paint with a make-up wipe. I tried that and it helped a bit. The colour remained but the greasiness started to come out. I figured make-up wipes were an expensive option so after four, I reached for a pack of baby wipes. They worked too. Twenty odd baby wipes later his hair had gone from black to dark brown but he was wailing and moaning at all the rubbing. Fortunately it was Halloween dress-up day at school today so I had an extra day to get it clean. He came out of school today with his hair now somewhere between grey and what looked like dark green! I had since checked the packet of (German) face paint that Thomas had bought ten years ago... professional, adult oil-based face paint complete with its very own make-up removal oil - for skin use only! I have no idea how it had come to be put with the kiddie face paint. Of course, Charlotte can't read German instructions, can she? I was bemoaning this at the school gate when a friend mentioned she'd managed to remove gloss paint from her own hair last week (after she'd painted her hall doors) using olive oil, so poor Léon was dragged home, scrubbed with a face cloth drenched in expensive extra-virgin olive oil and dooked once more - well actually four more times but he finally seems to be almost blond again, (though the bath is black)!